Warm up this season with something hearty! 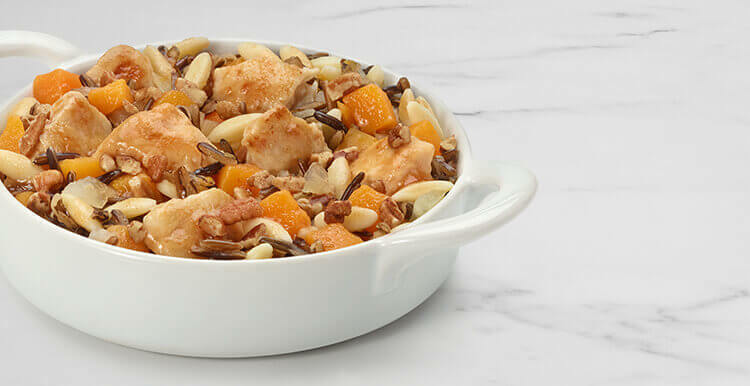 Roasted chicken glazed with a sweet sauce alongside a blend of savory butternut squash, wild rice, orzo, and onions topped off with chopped pecans. Ingredients: ROASTED SEASONED WHITE MEAT CHICKEN (CHICKEN WHITE MEAT, WATER, LESS THAN 2% MODIFIED FOOD STARCH, BROWN SUGAR, CORN OIL, SALT, NATURAL FLAVOR, PAPRIKA), WATER, BUTTERNUT SQUASH, COOKED WILD RICE, ORZO PASTA (WATER, SEMOLINA [WHEAT], NIACIN, FERROUS SULFATE [IRON], THIAMINE MONONITRATE, RIBOFLAVIN, FOLIC ACID), ONION, BROWN SUGAR, PECANS, SOY SAUCE (WATER, WHEAT, SOYBEANS, SALT, ALCOHOL, VINEGAR, LACTIC ACID), RESISTANT MALTODEXTRIN, MODIFIED FOOD STARCH, TOMATO PASTE, CHICKEN BROTH CONCENTRATE (CHICKEN BROTH, SALT, CHICKEN FLAVOR [CONTAINS CHICKEN FAT, FLAVORING, DEXTRIN], MODIFIED POTATO STARCH), RENDERED CHICKEN FAT, APPLE CIDER VINEGAR (DILUTED WITH WATER TO 8% ACIDITY), VANILLA EXTRACT (WATER, ALCOHOL, SUGAR, VANILLA BEAN EXTRACTIVES), FLAVOR (FLAVOR [CONTAINS CANOLA OIL]), SPICES. Nutrients: ROASTED SEASONED WHITE MEAT CHICKEN (CHICKEN WHITE MEAT, WATER, LESS THAN 2% MODIFIED FOOD STARCH, BROWN SUGAR, CORN OIL, SALT, NATURAL FLAVOR, PAPRIKA), WATER, BUTTERNUT SQUASH, COOKED WILD RICE, ORZO PASTA (WATER, SEMOLINA [WHEAT], NIACIN, FERROUS SULFATE [IRON], THIAMINE MONONITRATE, RIBOFLAVIN, FOLIC ACID), ONION, BROWN SUGAR, PECANS, SOY SAUCE (WATER, WHEAT, SOYBEANS, SALT, ALCOHOL, VINEGAR, LACTIC ACID), RESISTANT MALTODEXTRIN, MODIFIED FOOD STARCH, TOMATO PASTE, CHICKEN BROTH CONCENTRATE (CHICKEN BROTH, SALT, CHICKEN FLAVOR [CONTAINS CHICKEN FAT, FLAVORING, DEXTRIN], MODIFIED POTATO STARCH), RENDERED CHICKEN FAT, APPLE CIDER VINEGAR (DILUTED WITH WATER TO 8% ACIDITY), VANILLA EXTRACT (WATER, ALCOHOL, SUGAR, VANILLA BEAN EXTRACTIVES), FLAVOR (FLAVOR [CONTAINS CANOLA OIL]), SPICES.